GetBackpacking! Archives - Page 6 of 7 - GetGoing NC! On our latest GetBackpacking! graduation trip, to South Mountains State Park. When Great Outdoor Provision Co. and GetGoingNC started the GetHiking! program in September of 2013, we did so on a hunch that more people would hike if they wouldn’t be left in the dust a mile down the trail. Thus, one of the key features of our hikes is that no matter how leisurely your pace, no matter how much you like to stop and smell the flowers, you’ll never look over your shoulder to find no one behind you. The concept seemed to appeal: today, our Meetups in Charlotte, the Triad and the Triangle have about 2,400 members. 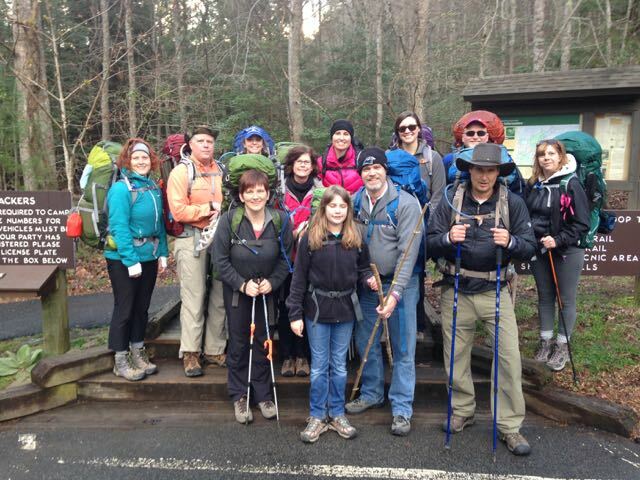 Last year, we had a similar hunch about backpacking, so we started the GetBackpacking! 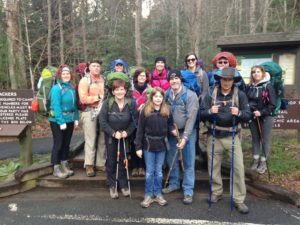 program, a series of four training hikes capped by a three-day, two-night graduation trip to South Mountains State Park. We’ve done four sessions, all four sessions filled up. Thus far, we’ve graduated about 40 backpackers through the program. Backpackers who are eager to keep backpacking. Today, we launch a series of monthly backpack trips throughout the region targeted to the emerging backpacker, but certainly suitable to those with more backcountry experience.